Areas on a building that seldom receive rain-washing gather salt, dust and other contaminants. When condensation, dew or humidity moistens these particles, they react with metal cladding. The reaction is often noticeable as a white zinc corrosion effect, which will precede more serious corrosion. An unwashed or sheltered area is any surface that is above or inside a line drawn at 45° to any weathertight overhang. Such areas require special consideration, particularly in severe environments. Unwashed areas include: unlined soffits, roof overhangs, canopies, sheltered walls, and the upper part of garage doors. Wall claddings receive less effective rain washing than roofs, and may be harder to maintain or replace, so materials for wall cladding should be selected accordingly. Poultice corrosion or 'under deposit corrosion' is caused when a collection of fine dust — e.g., from earthworks and quarries, or sawdust and shavings from timber processing plants — collects in crevices behind laps or flashings. These collections increase the time of wetness and retain contaminants. 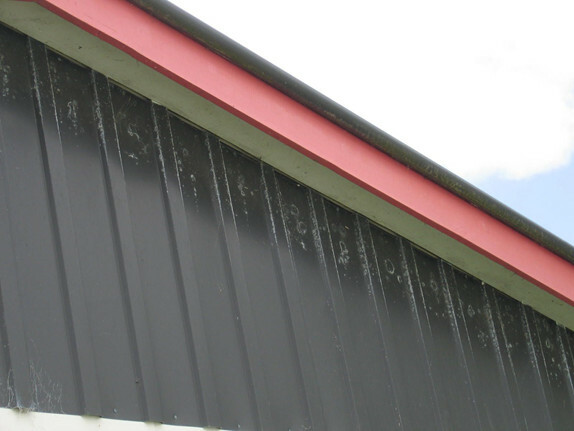 Bird droppings can contain highly corrosive and adhesive materials that will affect metallic cladding. Birds can also deposit other injurious material, e'g', fish frames and chicken bones. Solar energy collectors consisting of solar water heaters or photovoltaic (PV) panels may be attached directly to the surface of profiled metal roof cladding or mounted on a frame above the roof plane. For direct fastened applications, a complete seal between the PV cells and the cladding is essential to prevent water ingress resulting in wet storage corrosion. Solar frames installed above the roof surface must have a sufficient gap underneath to allow manual washing of the roof surface. The minimum gap is 100 mm, but greater clearance may be required for more extensive installations. The unit must be connected to the roof at the rib adjacent to a purlin line, have a waterproof seal, and be made of materials compatible with the roof product. Discharge, run-off or contact with copper must be avoided with both plain and pre-painted roofing. The combination of hot water and copper is detrimental to all types of roofing, and hot water from copper pipes will exacerbate the corrosive effect of copper itself. Water from the exhaust pipes of hot water cylinders or pressure relief-valves must not be permitted to discharge onto metal roofs. The copper pipes of solar panels, air-conditioning or other ancillary equipment must be sealed to avoid runoff onto any metal cladding or gutters other than copper. Only aluminium, stainless steel, inert plastic, or hot-dipped galvanized steel framing members are acceptable for support structures above steel cladding and must be supported by the structural members or across the ribs of the profile adjacent to the ribs. They should be designed to allow natural rain washing of the roof underneath. While capillary action is both a durability and a weather tightness issue, it is considered here because it affects durability more often than water tightness, although the two are inter-related. Capillary action is the ability of a liquid to flow into narrow spaces without the assistance of, and in opposition to, external forces such as gravity. It is caused by the combination of intermolecular forces of surface tension in the water and adhesive forces between the liquid and surrounding surfaces. The effect can be seen in the drawing up of liquids between the bristles of a paintbrush, in absorbent materials such as blotting paper or a sponge, in a burning candle, a fountain pen, or the cells of a tree. The effect can occur in a tube, but also between two closely spaced mating surfaces. Gravity will affect the degree of capillary action; a low sloping pair of surfaces will attract liquid more by capillary action than a vertical surface, and a narrow tube will draw a liquid column higher than a wider tube. Closely stacked sheets of trapezoidal or corrugate profiles, or flat sheet that has the sheet ends exposed to rain, will draw water between the surfaces which can infiltrate a long way into the stack of material. After a short time in the absence of air, it can form volatile corrosive products which are unsightly and detrimental to product life. While metallic coatings have temporary surface protection against wet storage stain and organic coatings also give some protection, there is no hard and fast rule as to how long this will last; it is up to the roofing contractor to take appropriate measures. Packs of close stacked sheets exposed to water must be fillet or cross stacked to allow natural air movement and drying, before the onset of wet storage stain. Capillary action can take place in the side lap of roofing sheets, or between a longitudinal flashing and the adjacent rib. For this reason, side laps should be designed with a capillary break, and when calculating the water carrying capacity of a profile, the allowable water depth is taken as being to the bottom of the capillary bead, not the rib height. Even corrugate profiles are designed to have an asymmetrical shape between under and over crest. However, this is not normally as effective as the capillary break on a rib profile. This is one of the reasons why the minimum pitch for standard corrugate is 8°, although it has been proven to perform at lower pitches in short runs if the dimension of the overlap is not too generous and it is not extending into the water table. With longitudinal flashings, such as barges, the downturn into the pan should not be tight against the rib, but have a gap to avoid capillary action from occurring. Capillary action is also common between the end laps of sheets. When short run sheets were the norm and end laps common, the onset of corrosion normally occurred around the lap despite primer being applied to the surfaces. It was most often concentrated on the upper end of the lap and was caused, not by rain water, but by condensation on the underside of the sheet entering the lap. End laps on roofing should be avoided where possible. Where they do occur, end laps must be sealed at both ends to avoid ingress of moisture from both internal condensation and external rainfall, and end laps in vertical sheets must be sealed at the top end of the lap. The adhesive nature of water that causes capillary action can help drive water up the underside of the sheets at the eaves, rather than discharging into the gutter. Therefore, the ends of all sheets laid to a fall less than 8° require a drip edge; and the minimum roof pitch of standard corrugate is 8°, as it is difficult to form a drip edge in that profile.The lower edge of all roofing sheets and flashings laid to a fall of less than 8° must be drip formed into the gutter to prevent capillary action. Roofing materials exposed to the air react with the atmosphere to form a relatively stable surface. Exposing metals to water in the absence air causes the formation of unstable surface films. Crevice corrosion occurs in crevices and confined spaces. Crevices are often created because of overlapping flashing or sheets of cladding, or between the sheets of close stacked materials. Design details that trap moisture, dirt, and debris should be avoided. Corrosion can appear even with a chemically neutral electrolyte. An example of this type of corrosion is the corrosion on metals underneath paint coatings and “white rust” — the wet storage stain on closely nested zinc coated roofing sheets. Other metals, such as aluminium/zinc coated and non-ferrous metals, can suffer similar damage. If end-lapping of roof sheets cannot be avoided, both ends of the lap must be continuously sealed to ensure that neither condensation run-off from the under-surface nor rainwater run-off enters the lap. Capillary action can cause water to be drawn into closely stacked sheets, resulting in crevice corrosion or wet storage stain on both metallic coated and non-ferrous materials. On metallic-coated steel sheets, the passivation coating gives some temporary protection against this process, as do organic coatings, but longevity cannot be guaranteed for the duration of this protection. On non-ferrous, metals, wet storage stain can commence very rapidly. Wet packs of sheets should be separated to allow surfaces to dry before substantial storage. If wet storage stain appears on unpainted surfaces, the degree of erosion of the metallic surface may be slight despite the bulky appearance of the deposits. However, when left unchecked it, can quite quickly lead to substantial degradation. If required, measurements can be taken of the thickness of the material or the metallic coating to determine the extent of erosion. Even if the damage is superficial, the white deposits must be removed to allow exposure to the air to allow the normal formation of stable surface films. Use a stiff bristle brush; wire brushes are not recommended as they will remove more of the protective coating. Microcracking is microscopic cracking on the surface. Microcracking of the metallic and/or organic coating creates a crevice where the normal protection mechanisms of the coating are compromised. It can lead to premature corrosion failure. The test requirement for paint adhesion in AS/NZS 2728 and by the NZMRM is a bend test over a nominated number of material thicknesses (T) and it is measured as the internal diameter. The radius required to avoid microcracking on metallic coated and pre-painted steel is measured externally. To obtain an external radius, add two material thicknesses to the internal diameter, and divide the result by two.